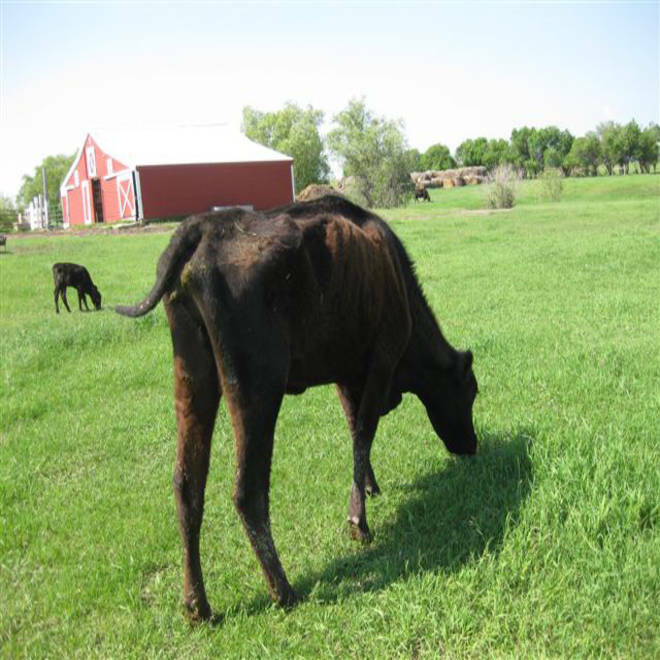 This cow on Jacki Schilke's ranch in northeast North Dakota lost most of its tail, one of many ailments that afflicted her cattle after hydrofracturing, or fracking, began in the nearby Bakken Shale. The authors compiled 24 case studies of farmers in six shale-gas states whose livestock experienced neurological, reproductive and acute gastrointestinal problems after being exposed — either accidentally or incidentally — to fracking chemicals in the water or air. The article, published in “New Solutions: A Journal of Environmental and Occupational Health,” describes how scores of animals died over the course of several years. Fracking industry proponents challenged the study, since the authors neither identified the farmers nor ran controlled experiments to determine how specific fracking compounds might affect livestock. In western Pennsylvania, an overflowing wastewater pit sent fracking chemicals into a pond and a pasture where pregnant cows grazed: Half their calves were born dead. Dairy operators in shale-gas areas of Colorado, Pennsylvania, West Virginia, and Texas have also reported the death of goats exposed to fracking chemicals. After drilling began just over the property line of Jacki Schilke’s ranch in the northwestern corner of North Dakota in 2009, in the heart of the state’s booming Bakken Shale, cattle began limping, with swollen legs and infections. Cows quit producing milk for their calves, they lost from 60 to 80 pounds in a week and their tails mysteriously dropped off. Eventually, five animals died, according to Schilke. Ambient air testing by a certified environmental consultant detected elevated levels of benzene, methane, chloroform, butane, propane, toluene and xylene -- and well testing revealed high levels of sulfates, chromium, chloride and strontium. Schilke says she moved her herd upwind and upstream from the nearest drill pad. 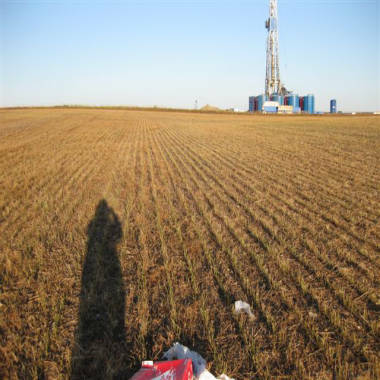 An oil-drilling rig is visible from Jacki Schilke's ranch in North Dakota. Veterinarians don’t know how long chemicals may remain in animals, farmers aren’t required to prove their livestock are free of contamination before middlemen purchase them and the Food Safety Inspection Service of the U.S. Department of Agriculture isn’t looking for these compounds in carcasses at slaughterhouses. Fracking proponents criticize Bamberger and Oswald’s paper as a political, not a scientific, document. “They used anonymous sources, so no one can verify what they said,” said Steve Everley, of the industry lobby group Energy In Depth. The authors didn’t provide a scientific assessment of impacts -- testing what specific chemicals might do to cows that ingest them, for example -- so treating their findings as scientific, he continues, “is laughable at best, and dangerous for public debate at worst.” Bamberger and Oswald acknowledge this lack of scientific assessment and blame it on the dearth of funding for fracking research and on the industry’s use of nondisclosure agreements. Last March, Christopher Portier, director of the National Center for Environmental Health at the U.S. Centers for Disease Control and Prevention, called for studies of oil and gas production’s impact on food plants and animals. None is currently planned by the federal government. “My beef sells itself. My farm is pristine. But a restaurant doesn’t want to visit and see a drill pad on the horizon,” said Ken Jaffe, who raises grass-fed cattle in upstate New York. Only recently has the local foods movement, in regions across the country, reached a critical mass. But the movement’s lofty ideals could turn out to be, in shale gas areas, a double-edged sword. Should the moratorium on hydrofracking in New York State be lifted, the 16,200-member Park Slope Food Co-op, in Brooklyn, will no longer buy food from farms anywhere near drilling operations -- a $4 million loss for upstate producers. The livelihood of organic goat farmer Steven Cleghorn, who’s surrounded by active wells in Pennsylvania, is already in jeopardy. “People at the farmers market are starting to ask exactly where this food comes from,” he said. This report was produced by the Food & Environment Reporting Network, an independent investigative journalism non-profit focusing on food, agriculture, and environmental health. A longer version of this story appears on TheNation.com.